Greenpeace is calling out companies who didn’t score highly on their list of green energy consumption. They have released their scorecard of various internet companies, ranking their participation in using green energy instead of “dirty” energy, or coal and nuclear power. The new report, “Clicking Clean: How companies are Creating the Green Internet,” scored Amazon and its services, and Twitter with the lowest grades of F’s and D’s. Both of these companies scored low in categories like Energy Transparency, Renewable Energy commitment, Energy Efficiency, and Renewable Energy Deployment. On the opposite end of the spectrum, Apple and Facebook scored near the highest possible scores. Apple’s data centers in Cupertino,California powered entirely by clean energy. 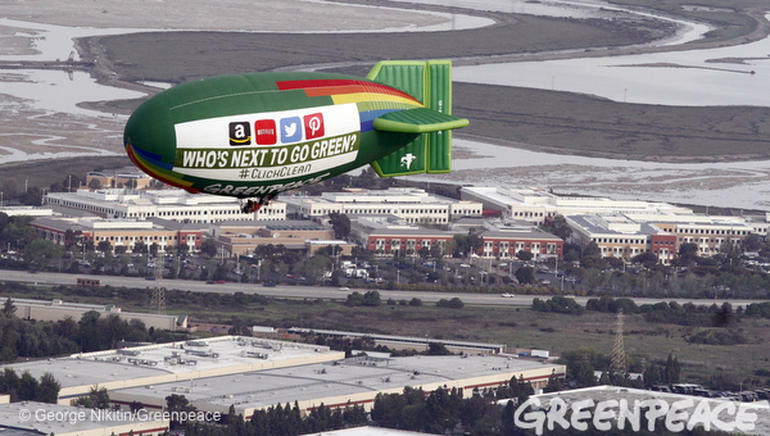 The day after the scorecard was released, Greenpeace flew their 135-foot-long blimp, called a “thermal airship”, over Silicon Valley. Instead of letting the scores go possibly unnoticed, the blimp applauds the high-scoring companies on one side, and challenges the lower-scoring ones on the opposite. 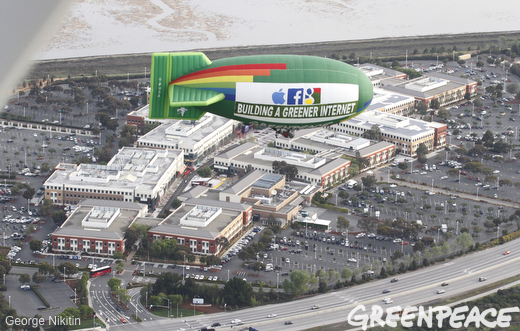 The logos of Apple, Facebook, and Google sit above the statement “Building the Green Internet”, while “Who’s Next to go Green?” is above the logos of Amazon, Netflix, Twitter, and Pintrest. The report shows that most of the industry is making strides to move forward with renewable energy sources, with the outliers hopefully soon to follow.